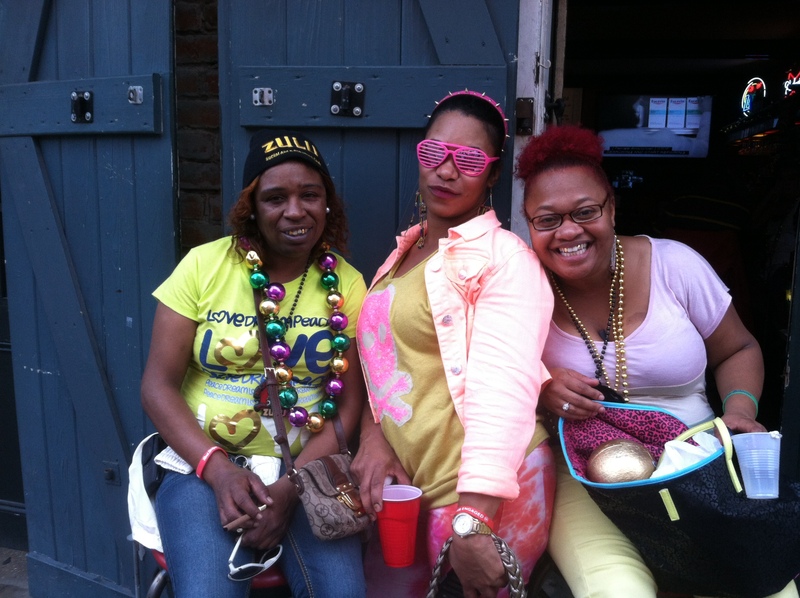 It had been over twenty years since I have been to New Orleans during Carnival season. This trip reminded me of what a great place New Orleans is. On short notice, Lyman invited Tootie and me to a very large and comfortable condo right off Canal Street, owned by his sister. We stayed with him and Gillian for about five days. They had brought bikes with them from Austin, and the four of us rode all over, despite the fact that rain was predicted the whole time. 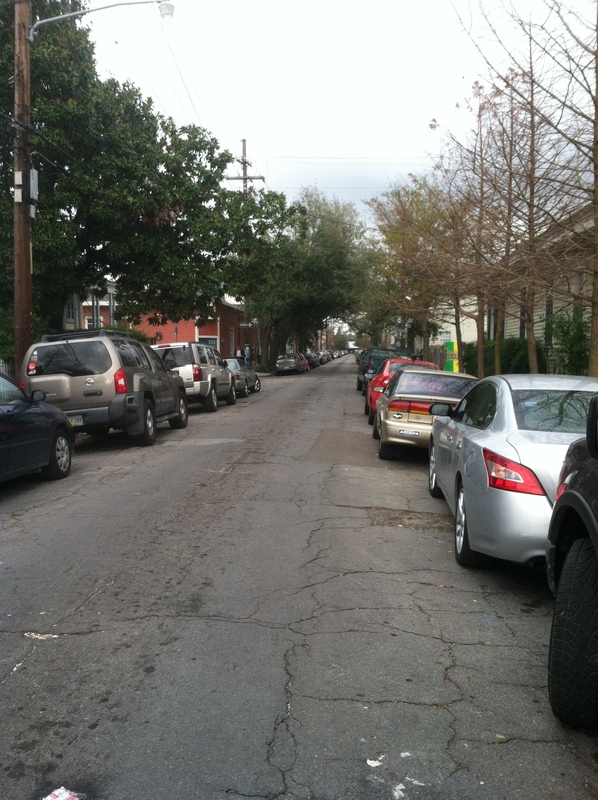 Saturday before Mardi Gras I rode by myself through Bywater, downriver from the French Quarter and Fauborg Marigny, but upriver from the much publicized Lower Ninth Ward. 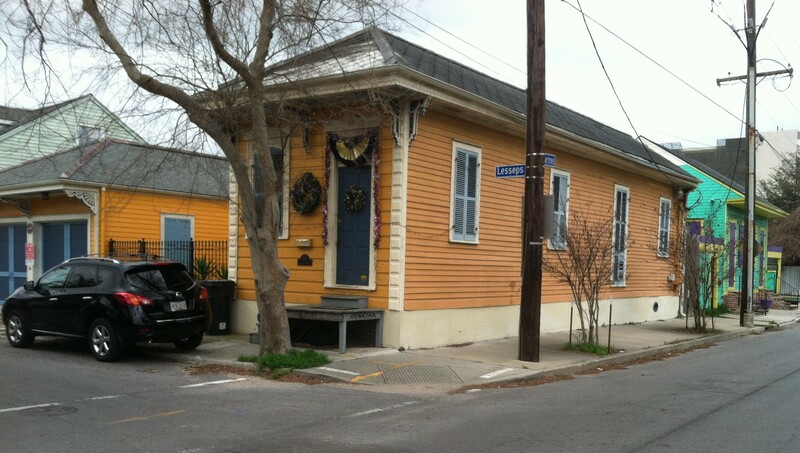 Bywater, also called the Upper Ninth Ward, is easily the coolest place in America right now. Iit is a mixed working class neighborhood, with artists and hipsters from all over the country moving there. 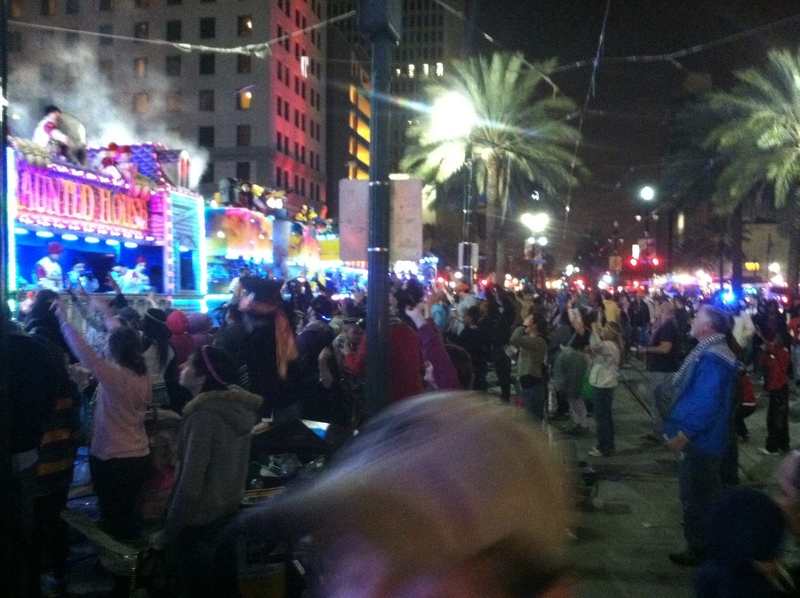 There were all sorts of impromptu Mardi Gras parades and celebrations going on. The streets here are amazingly long and straight! 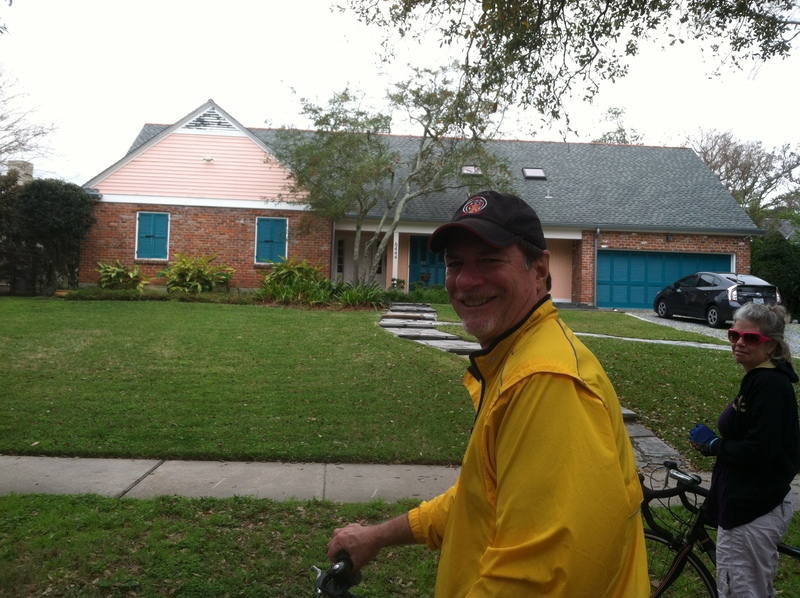 Sunday the four of us rode out to Gentilly, near the lake, searching to visit Lyman’s roots. Lyman and Gillian, in front of the house Lyman grew up in. 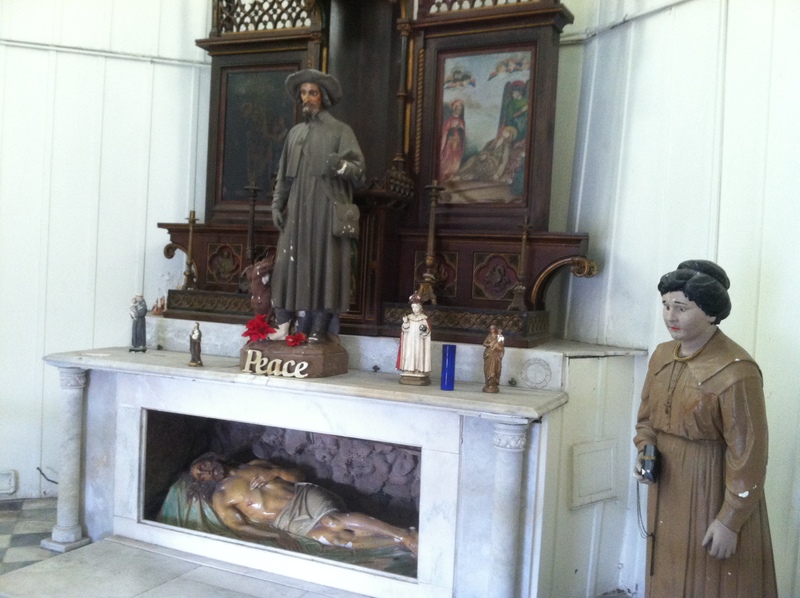 We also visited the St Roch Cemetary and Chapel, in the same general area as Bywater, but on the inland side of St Claude Avenue. The chapel is in the center of the cemetary. 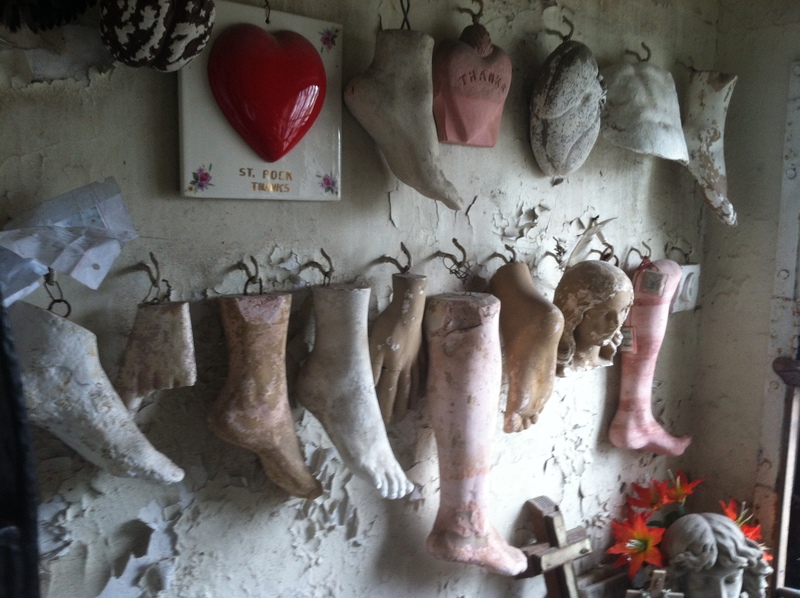 As offerings, people had given not only fake body parts, but also prosthetic limbs. We have to thank Lyman for this; his high school buddy had lived across the street. New Orleans never ceases to amaze me. 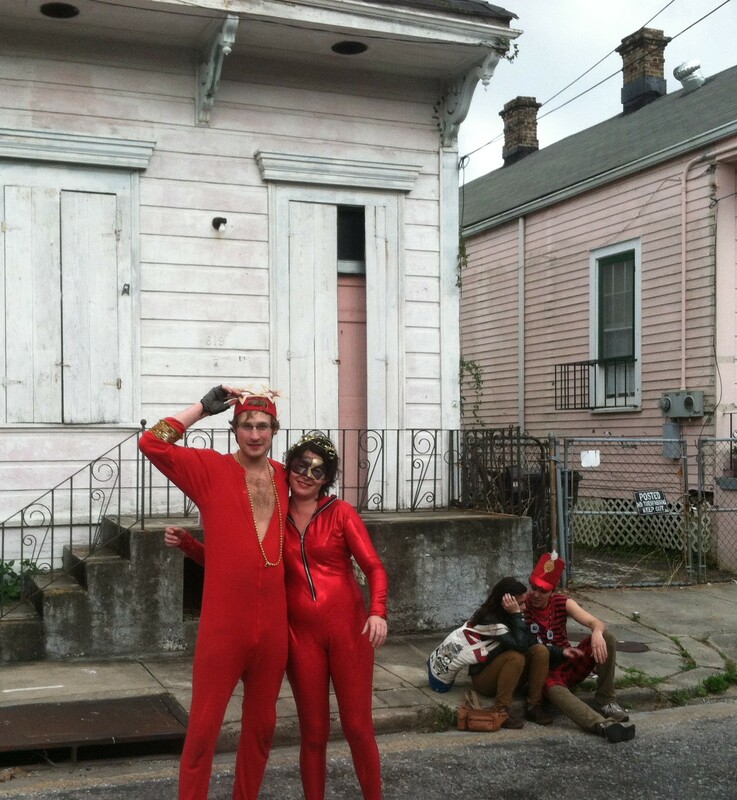 Mardi Gras Tuesday was awesome. 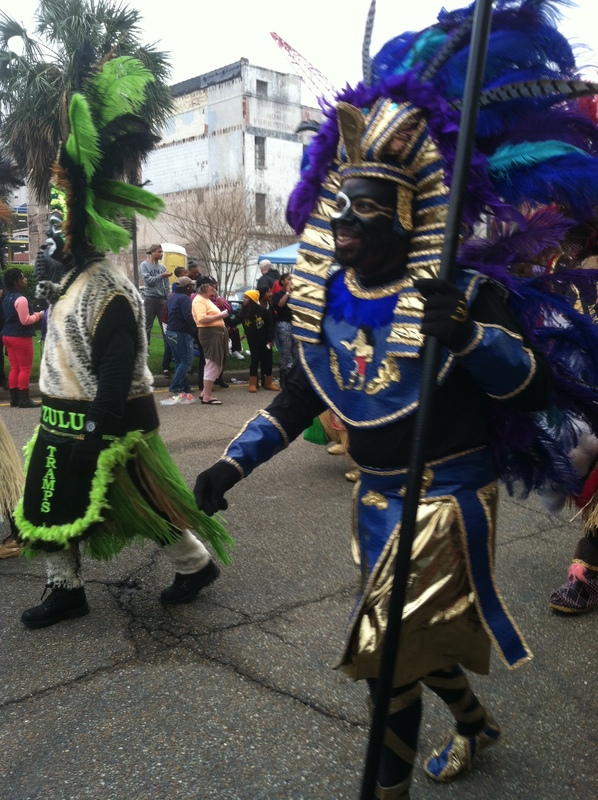 Lyman’s sister’s condo overlooked the route of the Zulu parade, where blacks apparently mock themselves, dressing in minstrel colors with costumes and props in jungle themes. 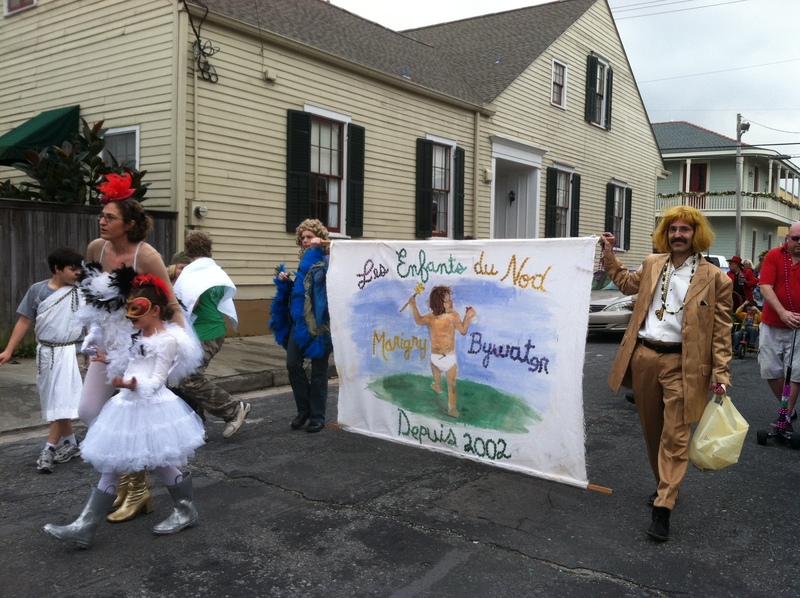 This parade, going on since 1907, now attracts the movers and shakers of the New Orleans black community. 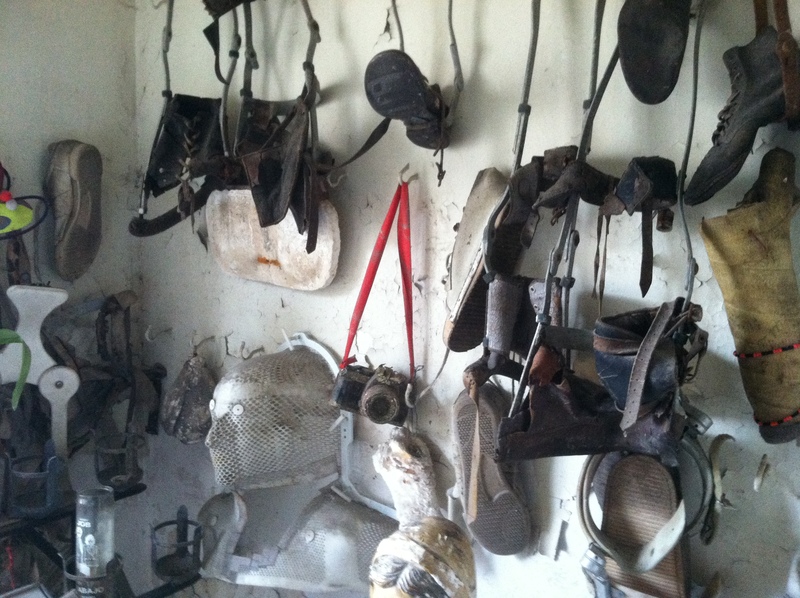 Lyman reminded us of the importance of masking. 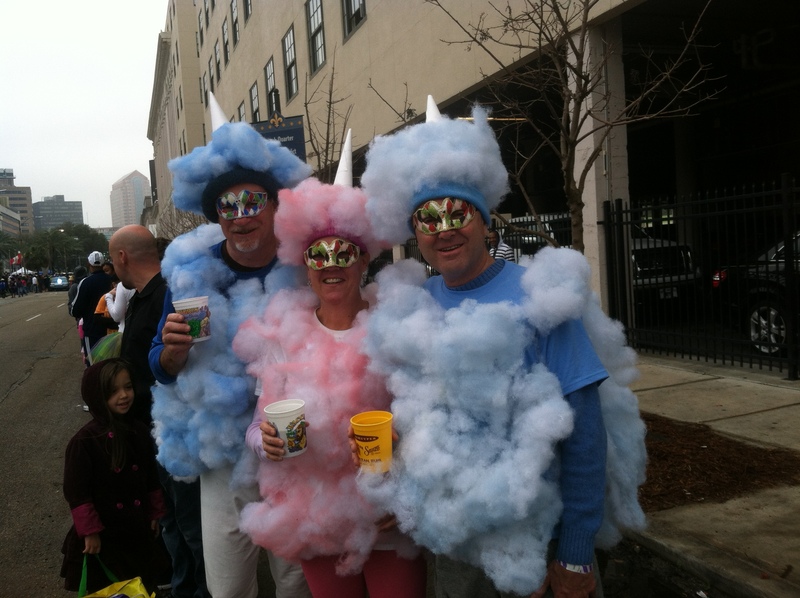 In New Orleans on Mardi Gras you do not “dress in a costume.” You “mask”, as in “are you masking this year?” Tootie made these costumes in Carrboro. 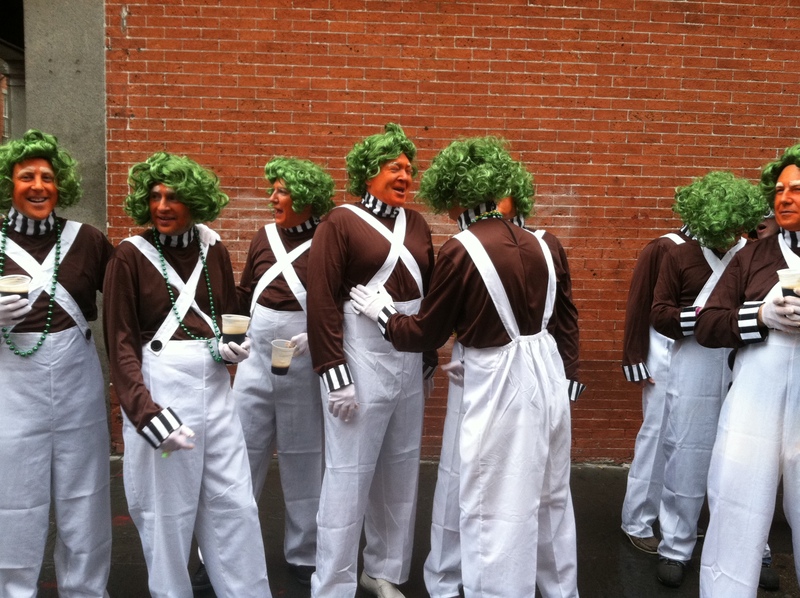 We saw lots of other wonderful costumes that day, as well as parade after parade. watching the parades; note she has a Zulu coconut!